Christmas time comes and we all invade the "spirit of Christmas". That feeling of happiness, family company, of year-end balances and the opportunity to start everything from scratch. If you have small children, the excitement about the visit of Father Christmas or Santa Claus is an excellent excuse to fill the occasion of meanings and emotions. And what better to accompany all those emotions with a beautiful Christmas decoration style homes? The traditional Christmas tree and elements can complement them with wall decals for your home decorating project in Christmas style really stand out for its originality and freshness. The options are endless: if your style is more traditional or conservative, can include details such as lines or borders in Christmas colors: red, green, gold, silver, to give life and a Christmas touch to your decor. Remember that the wall decals are easy to apply and remove, so can withdraw anytime without leaving marks or stains. Vinyls are highly customizable, so you can order the design, form, color and size you need or prefer. For those who celebrate the occasion and give importance to religion, there is the possibility to order a beautiful image of the Manger and The Holy Family to accompany the Christmas dinner and throughout the holiday season. If it is a house with small children, you can opt for a figure of Santa Claus tender for the living by the tree, or in your own room. Another popular design wall decals consist of one or two figures of reindeer and full of joy beautify your room or any room of your home. There are also different designs of Christmas trees that can be placed on doors, windows, walls, etc. If you do not like the typical Christmas themes but still want to give a new look to your space, you can opt for modern designs that frame the holiday season, such as stars, circles and lines of different colors and even phrases. Given the change of year, you can take your home decor for a small "ceremony", placing the year number that is gone, and changing it to the one that arrives with your loved ones. Christmas can also come to your office in the form of vinyl. Place a modern vinyl tree spread the Christmas spirit to everyone present. If you have a trade, it is an excellent opportunity to attract more sales by decorating the windows. The vinyl will give the Christmas touch with allusive words or figures. The vinyls are particularly suitable for these activities as you can place and remove without the need for a professional and only take a moment. You see, there are countless options offered by the wall decals for the holiday season, both for your home, children's rooms and even the office. Enjoy and have fun decorating! 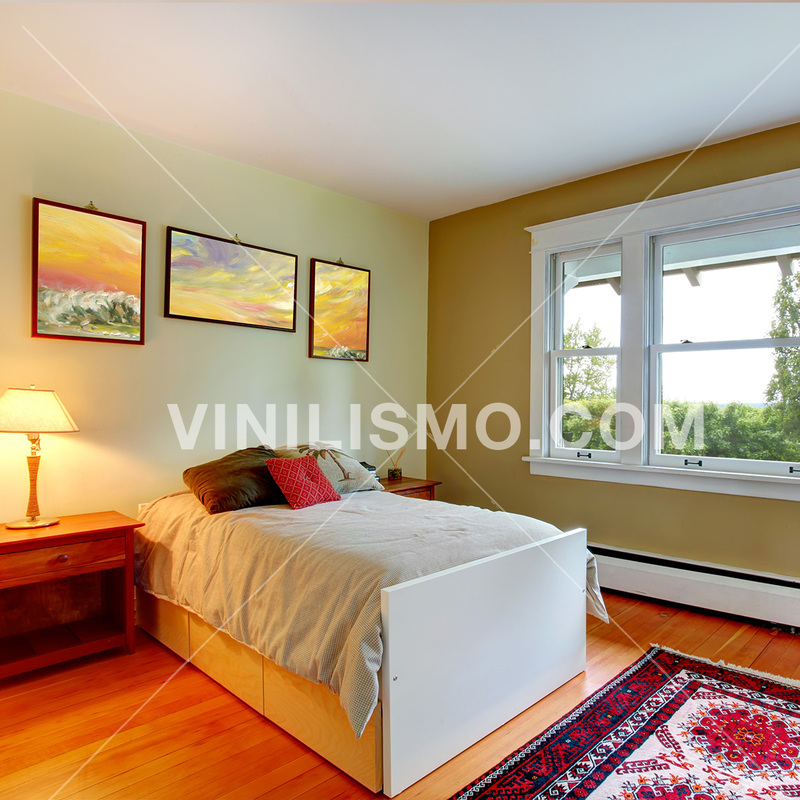 This entry was posted in Interior Decoration, Wall Decals on December 31, 2015 by Vinilismo. This entry was posted in Interior Decoration, Wall Decals on December 18, 2015 by Vinilismo. Give importance to the walls of your rooms is a smart and efficient way to deal with your decorating project. The walls have great visual impact being the largest room surfaces. Thus, painting a wall with a smooth color is wasting a great opportunity. The best way to leverage your walls to add to the decor, is the use of wallpaper. The wallpaper covering imperfections of your walls, hidden spots and blemishes and gives new life to the environments. The wall decals also have the advantage of adapting the size of the walls. Do you have wall space that has become empty next to a library? You can place there a custom vinyl with any form. You should not limit yourself to buy a wallpaper covering all the walls of the room. Harnesses the power and versatility offered by wall decals. The geometric patterns can create interesting visual effects, such as to show a higher than it actually is ceiling. Floral prints can give your living room or bedroom a touch of romance and femininity that you are looking for. There are even versions that have a touch of humor that can be used in a space of young job. If you have a design in mind, you can order in our store. It is a highly customizable material. If large prints are not your thing, or do you prefer a solid color that predominates, there are wallpaper borders made with vinyl, which will give that finishing touch to your wall. In turn, you can find a variety of children's designs for children's rooms. They are versatile: They come in various prints and colors. They can be used on walls, but also on other surfaces. Some people even decorate their furniture (tables, libraries) and appliances (refrigerators, microwave ovens) with special motives made with vinyl. There are also designs with textures and visual effects. They are easy to install: Its placement does not take much time and no need of special materials. They can be placed by anyone, ie it is not necessary to hire a specialist. Their placement is clean and does not require empty room or cover the furniture as if you must when you paint a room. Removing them is even easier, making them a suitable choice for those who get bored quickly and need vary it periodically the decoration. Do not require special drying time and depend on the weather to place better, do not emit toxic gases and strong odors. Therefore, you can place your vinyl or wallpaper anytime of the day. Decorating with vinyl offers many possibilities allowing you to leave your imagination and your creativity put into play. But also let you save time by choosing to place a clever design if you do not feel particularly inspired. Remember that the vinyls are easily adapted to the particular needs of your decorating project. This entry was posted in Wall Decals, Wallpaper on December 11, 2015 by Vinilismo. When we dedicated ourselves to decorate a room, usually we give greater importance to some areas than others. First choose the colors of big surfaces, then pay attention to the furniture that deal space. We will also consider textiles: carpets, curtains, tablecloths, etc. But when planning a creative strategy, we can make the mistake of ignoring corners left "blank". These corners can be exploited with a little ingenuity, to finish to complete the idea of the room. To decorate the corners of your home, you can decide whether you want a simple decoration or to be functional. For a simple decor, you can always turn to nature. A pot that matches the style you have chosen, will give life to this forgotten corner. A practical option is to create a reading corner. Place a corner shelves and there, put your reading material. You can also take advantage of the corners to set up a small working space: a boy desk for your laptop, a comfortable chair and you're done. The idea of the reading corner is versatile and can adapt to your bedroom or living room. If you or someone resides with enjoy cooking, you can even create a corner for books in your kitchen, using shelves containing utensils, ingredients and recipe books. Another alternative is provided by the mirrors. A corner is a good place to place a large mirror, as it will change the perception of space. If you have a set of chairs, try to place them so that you take advantage of all the space: a fair chair in a corner and the other around. To give a special touch to your graphic corners, another option is to buy wall decals and play with the wide possibilities offered. To give life to this forgotten corner, you can buy wall decals and place them. One option is to choose a symmetrical reason, and place it right on the corner, with one half for each wall. The visual effect is very original, and give continuity to the space. It is especially suited for large spaces. If you have interested in our idea of reading corner, a vinyl is fantastic to complete an original library. You can purchase wall decals to place above the corner shelves and simulate a traditional library. If you get a piece of furniture to put in an empty corner, you can also decorate it with wall decals. Looking at our catalog and find a design that matches your style. If not, remember that the vinyls are highly customizable. You can also arrange the design or image you want and place it yourself. Vinyls are clean and simple installation: no need to place empty room. Simply prepare the wall and place it carefully. When you want to change this, simply take off and you put another design. This way you can change the appearance of the corners simply and without spending too much money. Empty corners are opportunities to give the final touch to your decor. Take advantage of them! This entry was posted in Interior Decoration, Wall Decals on December 4, 2015 by Vinilismo.